The loss to Houston plus the Suns' overtime victory over the Pelicans means one thing: The Knicks (15-64) will finish with the worst record in the NBA. HOUSTON — You would think that in the course of compiling a 15-64 record with three games left — clinching the league’s worst record — the Knicks would have hit rock bottom. But as they worked out Friday morning, rock bottom seemed like just a stopping point on the way to a gaping abyss. Emmanuel Mudiay was ruled out with a sore left shoulder, joining Dennis Smith Jr., Frank Ntilikina, Kadeem Allen and Allonzo Trier on the sideline. That left only Billy Garrett, who was called up from the G League on Tuesday and had 12 minutes of NBA experience, as the lone point guard on the roster. So David Fizdale announced a lineup with 6-8 Mario Hezonja starting at point guard against the Rockets. Hezonja had been collecting DNPs before getting a chance to start at power forward against his former team in Orlando two nights earlier. But after confidently asserting that he had played point guard in his rookie year and “before, it was my natural position,” he amassed his first career triple-double with 16 points, 16 rebounds and 11 assists Friday night. And as one might have expected, it mattered little as the Knicks lost to the Rockets, 120-96, after falling behind by as many as 42 points. The confidence in the morning was palpable. 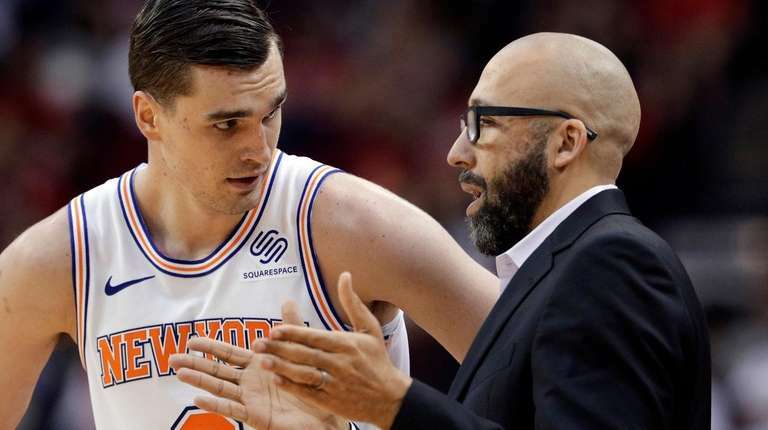 Fizdale spoke his usual encouraging words about a great workout and a solid plan, and Hezonja challenged anyone who doubted his ability to play point guard against the backcourt of James Harden (26 points) and Chris Paul. And the reality is that this is how you chase down the worst record in franchise history. While Fizdale and the Knicks’ front office have tried to downplay just how bad things have gotten in a season that began as a player development campaign and turned into a shedding or sitting of anyone who could push the team to forfeit a spot among the worst teams heading into the NBA Draft lottery, Thomas doesn't want to be part of another worst. Notes & quotes: Fizdale said he holds out hope that Smith or Mudiay can make it back for one of the final three games, but he doubts that Noah Vonleh or Trier can play again this season . . . The Knicks clinched a tie for the worst record in the league when they lost to the Rockets, and when the Suns subsequently beat the Pelicans in overtime, that honor belonged to the Knicks. The Suns moved to 19-61, the same record as the Cavaliers, and the Knicks can do no better than 18-64. The Suns swept the two-game series against the Knicks, but if they had finished in a two-way tie for the worst record, a coin flip would have determined which team finished with the worst mark.